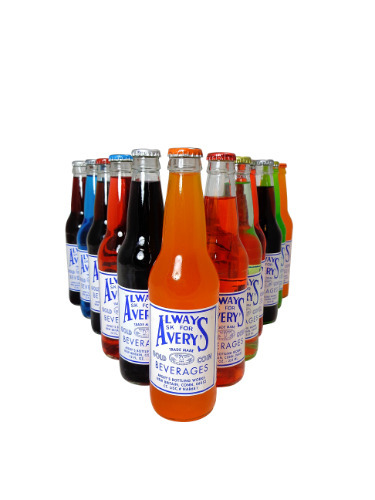 FRESH 12 pack 12oz glass bottles Avery's soda Variety set which are always made with CANE SUGAR!!! No HFCS!!! The Avery's line of sodas has been a central Connecticut favorite since 1904. Avery's sodas are still handcrafted using methods and recipes from generations ago including real cane sugar, the finest quality ingredients and naturally pure well water. Each flavor is carefully made in small batches and is packaged only in glass bottles to preserve the wonderful old-fashioned flavor. This variety pack comes with one bottle of each of the following 12 flavors: Black Cherry, Blue Raspberry, Cola, Red Cream, Grape, Orange, Peach, Strawberry, Melon, Root Beer, Lemon Lime and Orange Cream. Trust us when we tell you that the Avery's brand of soda is simply one of the absolute finest craft sodas on the market today! !